In July 2015, Stephen and Elspeth made the 3,300 mile road-trip from northern California to the AEC campus to join our team. Stephen, a graduate of Alaska Bible Institute (Homer, AK) is serving as Resident Director, working closely with the Building Hope Construction program. Elspeth, having been employed most recently for 5 years at a hospital in Sonora, CA, is serving as our Professional Medical Coding coordinator. As a couple at AEC they are building relationships, mentoring, and serving the residential student population that come from various villages throughout the state. They have recently welcomed a new addition to their family, Jedidiah (2016), and are thrilled to be parents to their adorable little boy. Carmen and her husband, Scott, first came to Alaska in 1985 and immediately knew they had found home. It’s been Carmen’s passion and joy to work with young people in various ministries, both vocational and volunteer for over 30 years. She was privileged to join the staff at Amundsen Educational Center in 2009 and believes deeply in the mission of AEC. Carmen also serves as Director of Youth Ministries at Peninsula Grace Brethren Church, is part of the worship team and loves her home group. She enjoys photography, scrapbooking and most of all loving her family! Scott and Carmen have three grown children and five grandchildren. Keith and Mandy Pieh began ministry the summer of ’98 as they moved to Fairbanks to work with Covenant Youth of Alaska (CYAK) in its ministry to Native college students at UAF. Along with doing college ministry, Keith continued working as a carpenter during their 6 years in Fairbanks, and Mandy as administrative assistant/bookkeeper for the statewide CYAK organization. 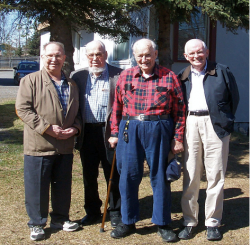 In the spring of ’07, the Piehs responded to God’s call to serve at AEC, and moved to Soldotna. Keith now brings his experience in Native youth ministry and his giftedness in carpentry work to his position as AEC’s carpentry instructor. They have four children: Emily (1999), Joshua (2002), Andrew (2005), and Rebekah (2009). The Amundsen Educational Center is a faith-based vocational training school that was originally founded to serve primarily Native Alaskan students. Such a school had long been the dream of Rev. Roald Amundsen, a long-term missionary and pilot who was the founder and director of Missionary Aviation Repair Center (MARC) in Soldotna. When a parcel of land was donated to Amundsen for charitable purposes in the mid-90s, he asked the help of Rev. Maynard Londborg and Rev. Donald Bruckner in establishing plans for a vocational school. Londborg and Bruckner added veteran Alaskan physician Dr. Robert Fortuine to the group and the three met regularly to develop plans for the venture, which was finally incorporated in 1996. The founders named the school in honor of Rev. Amundsen in recognition of his dream and his lifetime of service in Alaska. Much essential developmental work was then carried out over the next few years under the leadership of the first director, Del Corrick. After a pilot project in Fairbanks coordinated through Covenant Youth of Alaska and Byron Bruckner, the school formally opened in Soldotna in the fall of 2001. Shortly thereafter, AEC became authorized through the Alaska Commission of Postsecondary Education to provide graduates with a 1st year Certificate in Residential Construction, and a 2nd year Advanced Certificate in Residential Construction. This training in construction eventually led to the creation of Building Hope Construction. More than 40 students from 18 rural villages have been trained to build homes through the BHC program. BHC has found a niche serving Native Alaskans through a culturally relevant, student-centered education characterized by small class sizes (1 instructor: 5 students) and intensely practical instruction. Additionally, the community living environment encourages students from rural Alaska in areas of personal development and offers comprehensive training for employment in the Alaskan construction industry. Today AEC continues to provide vocational training in a faith-based environment for rural Alaskans as well as commuter students from the Kenai Peninsula. This mission is accomplished by providing students with quality vocational and work-readiness instruction, fostering a culturally relevant learning environment, honoring the dignity of every student, building a safe, nurturing community, and by creating a network of synergistic partnerships. ​Show your pride and support for AEC by wearing our name and logo. We recognize that everyone is not able to write a check each month or volunteer their time to support the ministry of AEC. Therefore, listed below are other ways you can contribute financially to this ministry. All donations, regardless of size, are very appreciated. Donations to AEC are tax deductible. If you are interested in leading or being part of a service team at AEC, please contact us for more information about how you can help!